Submitted by Jason Horton on Dec. 7, 2017. Originally published on August 8, 2016 and updated on December 8, 2017. Although to many purists the term Classical Guitar has a very specific meaning in terms of specifications, it has become a generic term meaning any guitar with nylon strings when it comes to the sub $1000 price range. So we will use the term Classical throughout this guide even when referring to crossover and acoustic-electric models. The Yamaha C40 has been an extremely popular beginner/student guitar for decades. 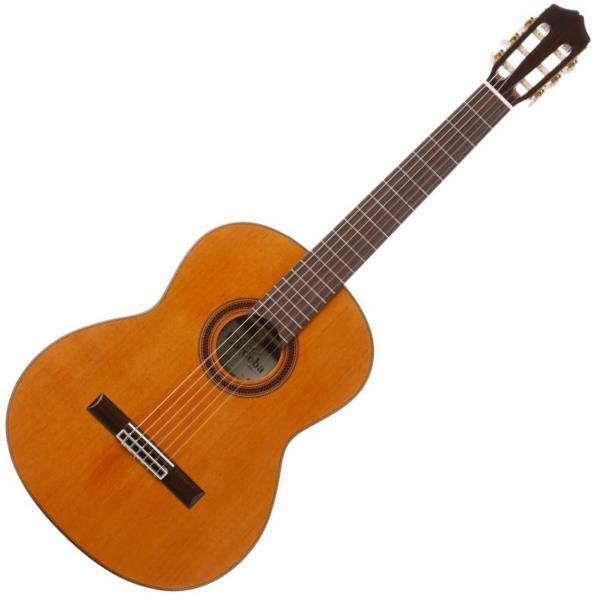 It has the main characteristics of a classical guitar including the nut width, scale length and string height. I have a personal soft-spot for it because it was the Mk I version of the C40 that I initially learned to play guitar on and I'm pleased to see that the MkII version has been rated so highly by today's beginning guitarists, their teachers and parents. Phrases such as "great beginner guitar", "best beginner guitar" or words to that effect are extremely common in customer reviews. Quite a lot of people who have bought this say they did so on the recommendation of a guitar teacher. Some experienced players who play higher-end classical guitars have mentioned in forums that they bought a C40 to use as a camping guitar. It's very hard to find any consistently reported negatives about this guitar - most negative reviews were about shipping issues or damaged/demo models that were sold as new. Whether you specifically want to learn Classical Guitar, or you simply want to learn guitar in general, you can't go far wrong with the world's most popular entry level nylon string guitar: the Yamaha C40. 92 out of 100. Incorporating 125+ ratings and reviews. Cordoba's C3M has the main characteristics of a Classical Guitar including the nut width, neck shape, scale length and string height. At the time of publication for the December 2017 update of this guide, the Cordoba C3M was the equal highest rated of all the nylon string guitars priced under $1,000. Customer reviews of the C3M often include phrases equivalent to "great value for the money". The positive reviews have come not only from people using this as a beginner guitar, but also more experienced players who wanted a low cost couch or camping guitar. Although there weren't really any consistently reported negatives, I did see a small number of customer reviews in which they said the bridge had come off, however most were not written by verified customers and a couple of them were written at around the same time on different websites and could have been from a single person who had a bit of bad luck. This is essentially Cordoba's entry level Classical Guitar (we ignored their CP100 which only comes in a package with other items) and is generally regarded by the market place as a step up from the "C40" models of other brands like Yamaha and Washburn. The Cordoba C5 is a step up from the C3M with most commentary on forums agreeing that the C5 has better sustain despite the specifications for the two instruments looking very similar. Where they differ is that the C5 has a slightly larger upper bout width, slightly longer overall length, slightly smaller soundhole, higher quality tuning pegs and a gloss finish instead of matte. Cordoba also say that this is one of their top selling guitars. As classical guitar teacher Ramon Amira put it, "I don't know a better guitar for that price", and that tends to sum up many of the recommendations for the C5 from experienced players and guitar teachers. Often repeated sentiments in customer reviews are that the C5 both sounds and plays like a more expensive guitar. There were some people who talked about quality control problems, particularly with the neck and bridge, but most of those were prior to the middle of 2016, suggesting that these issues have been fixed since then. If your budget is $300 then this is by far your best option. From the tonewoods used in its construction, to the dimensions of the body, neck and nut, the Cordoba C7 CD has a true Classical Guitar design. There is also a version called the Cordoba C7 SP which has a Solid European Spruce top, however it is only the Solid Cedar top version that we have rated and described here. A common theme expressed in positive reviews from experienced players was that they were impressed with the tone and the solid cedar top. There were also many classical guitar students who reported very positive experiences with this guitar. There was one negative that was reported multiple times and on more than one website - the bridge had either begun to lift or had come off completely. This issue was only mentioned in a very small percentage of cases and didn't occur frequently enough to have much impact on its overall ratings..
Based on the data we collected, this guitar is popular with experienced guitarists and serious classical guitar students, even at the college level. At the time of publishing the December 2017 version of this guide, the Yamaha NTX700 had the equal highest Gearank rating of all nylon string guitars under $1,000. The Yamaha NTX Series have the scale length of a Classical Guitar but with a thinner body, nut width and action that more closely resemble a Flamenco Guitar. Yamaha say they designed this series as a 'crossover' range that steel string acoustic and electric guitar players will find easier to adjust to than a standard classical guitar. Yamaha have also employed their A.R.E. (Acoustic Resonance Enhancement) technique to prepare the tonewoods in order to produce a result that Yamaha says makes them sound like aged or vintage instruments. These features are also found in the higher priced NTX1200R. In their January 2016 review, Acoustic Magazine concluded by saying, "There’s no doubt that players of acoustic and electric guitars would very quickly find themselves feeling at home with the NTX, blowing the doors wide open to a new timbral experience in the process. 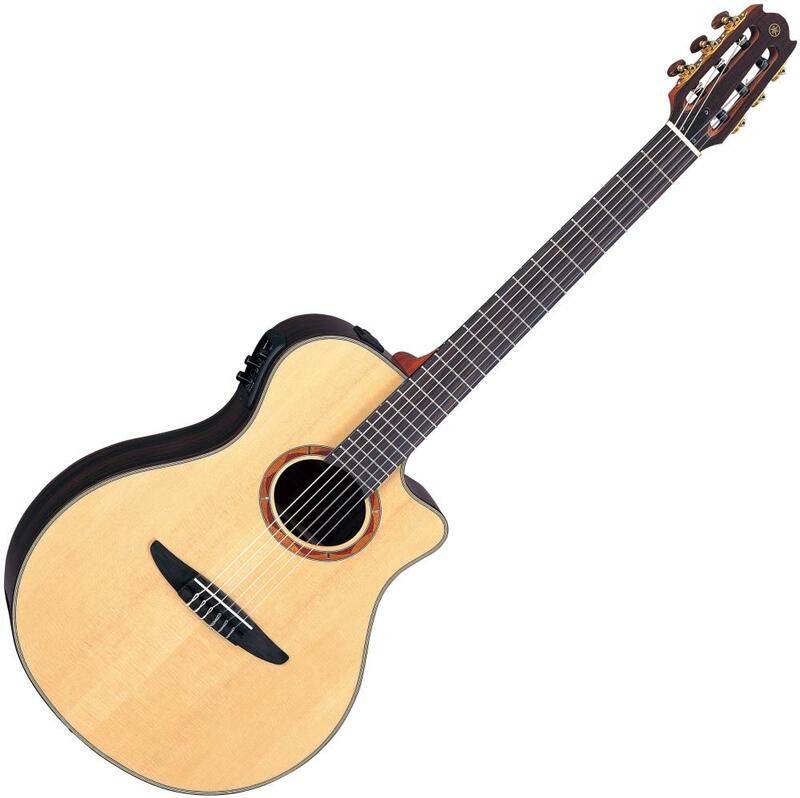 As a stage ready instrument it succeeds at virtually every level, the ART system proving its worth in giving an accurate account of the gently voiced forefather of the steel string acoustic"
Yamaha's goal of making this easier to transition to than a standard classical guitar appears to have worked with many customer reviews stating that they found this much easier for them to play than high action, wide nut classical guitars. The electronics and the pickups in particular were also praised in many reviews. There was no aspect of this guitar that came in for consistent negative commentary - this is not uncommon with a product that receives the highest Gearank score in its category as this did. If you are an experienced guitarist who wants to start playing nylon strings then this is the first guitar you should consider. 89 out of 100. Incorporating 30+ ratings and reviews. 'Fusion' refers to the fact that this is a crossover guitar with a nut width much smaller than a traditional classical guitar which makes it much easier to transition to if you're used to playing a steel string acoustic or electric guitar. Other than the cutaway section, the rest of the body has upper and lower bought and depth measurements that are similar to traditional classical guitars - the same goes for the neck thickness. It comes with Fishman electronics that includes a built-in microphone which helps to produce a more 'natural' tone which is particularly useful when recording. The preamp also has phase control which can help in reducing feedback problems when plugged into an amp. A common refrain in customer reviews is that this has full-bodied sound similar to that of a traditional classical guitar when unplugged. The plugged in tone is also well regarded. Surprisingly, I read several reviews that favorably compared their Fusion Orchestra CE with much more expensive Italian made Ramirez guitars! Several reviewers said this is a great guitar for Latin/Gypsy/Jazz styles. A small number of people pointed out that the mic part of the pickup can pickup vocals, so if you're using it with a looper and singing at the same time, or if you have feedback issues, then you need to adjust the pickup blend to turn the mic down. Some also complained that they needed to get a professional setup done to lower the action, however this is more of a personal preference issue but not an uncommon one from guitarists used to low action steel string guitars. If you want an acoustic electric nylon string guitar with a good classical sound when unplugged, then this is one of your best options. This guitar is similar to the NTX700 in that it has a thin body and small nut width designed to be more playable for guitarists who are crossing over from a steel string instrument. What sets it apart from it's cheaper sibling is that the NTX1200R comes with solid rosewood back and sides giving it richer tones slightly more similar to a traditional classical guitar. When we first published this guide back in August 2016, the Yamaha NTX1200R just missed out on making it onto our recommended list, since then however the reviews and forum discussions have become even more positive and as a result its ratings have gone up. As of the time of publishing this 2017 update, the NTX1200R is the highest rated option in the $500 to $1,000 price range. The quality of materials and construction frequency come up for praise in customer reviews, in fact many people said it was better than the crossover guitars from Taylor and Godin. The unplugged tone is often described as full and rich, despite the thin body design. The Yamaha A.R.T. pickup and preamp system is considered by many experienced guitarists to be the best available on nylon string guitars in this price range. At the time of publication, there were no consistently reported negatives. One experienced guitar teacher wasn't happy with the string spacing saying they are too close together, but he also praised the unplugged and plugged in tone. If you want to make a smooth transition from steel string guitars to nylon, and you have the experience to appreciate the difference in high quality materials and construction, then put this at the top of your list. This section explains some of the terminology that you will come across when you look at nylon string guitars and discussions about them - this along with a few tips will help you work out which guitar characteristics will suit your playing style. If you are unsure about what the different parts of a guitar are called then the diagram at the bottom of this blog post will explain them for you. Flamenco Guitars are generally built to have a more punchy sound and are intended to be played in a more percussive style including tapping on the top soundboard - in fact they usually have a protective plastic cover called a golpeador to facilitate this without damaging the finish. They have a smaller nut width which means the strings are closer together than on a standard classical guitar, and a lower action (aka string height). They are often made with spruce tops and cypress or sycamore back and sides to enhance volume from their thinner bodies. Their tonal characteristics are designed to cut through the sound of dancers loudly clapping and tapping their feet. Classical Guitars usually have deeper bodies, wider nut widths and higher actions than flamenco style guitars. They usually have thicker spruce or cedar tops and rosewood or mahogany backs and sides which tend to give them a more mellow or rounded tone roughly covering the frequency spectrum of an orchestra. They are primarily intended to be played solo or in very small ensembles. Spanish Guitars are a sub-set of classical guitars traditionally made in Spain with bracing, construction techniques and tonal characteristics which experts say vary by region. Concert Guitars are high-end classical guitars made by luthiers usually following centuries-old traditional methods and use of materials . A typical luthier may only produce 4 to 6 guitars per year or in a larger operation perhaps as many as 20. A lower priced concert guitar will usually cost between $2,000 and $3,000 with higher end models going well into the 5 figure range. Nylon String Guitars include all of the types of guitars above in addition to many modern hybrid guitars which can combine characteristics of many different types of guitars including steel string acoustic and electric guitars as well as some that come with pickups and electronics built-in. Due to the price range that this guide covers, most of the guitars here are considered to be Classical, Flamenco or Hybrid guitars. Just as with other types of guitars, there are ongoing discussions and debates about which species of wood produce superior tones or tones better suited to certain styles of playing. There are two main types of wood used for the top or soundboard of nylon string guitars:- Spruce is generally considered to produce a crisper tone with more definition while Cedar is regarded as having warmer or darker tones. However, many luthiers will tell you that the thickness of the wood, types of bracing and other construction techniques can be just as important as the materials in determining the tone. One thing that pretty much everyone agrees on is that having a solid wood top instead of a cheaper laminated wood top will provide better projection (they'll be louder) and lead to richer tones over time as the wood grains open up, with a caveat that on cheap guitars under about $150 a laminated top will have a more consistent tone between individual guitars of the same model than the variations in grain that come with cheap solid woods. Similar discussions take place about the woods used on the rest of the guitar, but the top or soundboard dominates in terms of tone. This is the main thing that determines the distance between the strings, although the width at the saddle plays a small roll too with the strings usually being closer to each other at the nut than they are at the saddle. The nut width and action height are the things that most influence the 'playability' of a guitar with smaller nut widths better being suited to guitarists transitioning from steel string guitars. Guitars with a low action allow for faster runs and the use of playing techniques such as tapping on the fretboard and hammering on/off. This comes at the expense of introducing some fret buzz which is actually considered a feature of flamenco style playing. Beginners and those transitioning from steel string acoustic or electric guitars generally find a lower action easier to play. For a more in-depth discussion on this topic see this thread on the Delcamp Classical Guitar Forum. Acoustic-Electric models come with pickups and other electronics such as preamps and EQ installed, while the straight-forward acoustic models don't. These additional components may have subtle effects on the tone or resonance of the guitar, but the most practical differences are that they cost more but can be amplified. With these criteria in hand we looked at the individual guitars that the major retailers in the USA listed as their most popular models and selected the most promising 59 guitars to process for their Gearank scores - you can see most of them listed in our public Music Gear Database. The Gearank algorithm processed more than 4,200 sources during this process. Finally, we selected the highest rated options to recommend in each of the 3 price ranges above. For more information about this process please read How Gearank Works. We aim to be thorough in our research but there's always a chance we may have missed something. 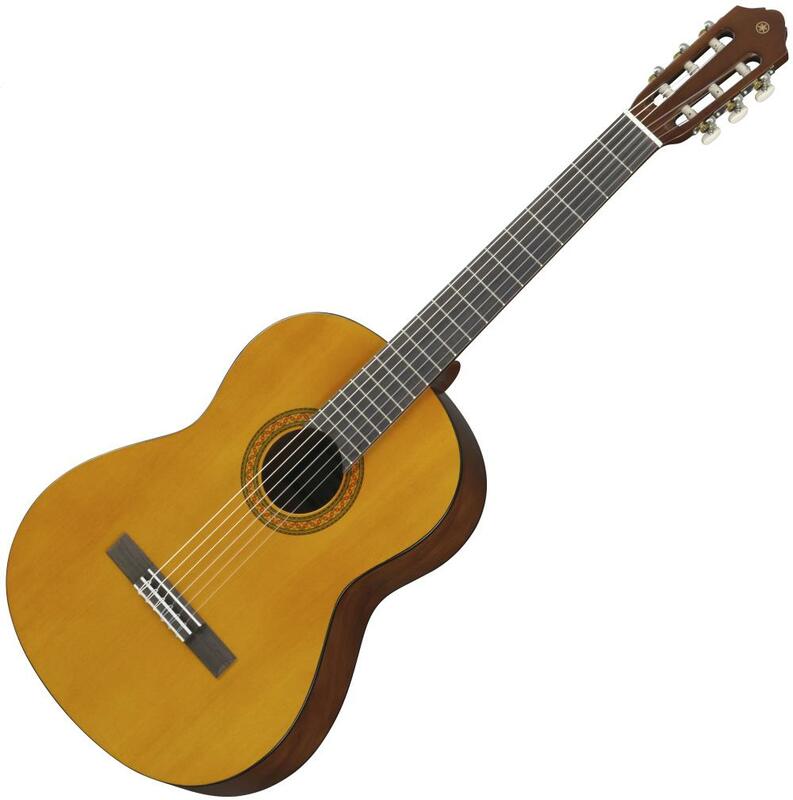 If you believe there is a nylon string guitar that we've missed which meets the criteria set out in the Methodology section above, then please check first to see if it's in our public gear database, and if it's not there please leave a comment below. Also please feel free to suggest any new models that come out if you would like us to consider them when we update this guide. Submitted by Phil Woodworth (not verified) on Sep. 22, 2017. Santos Martinez SM150CEA. My go-to practice guitar. £147 UK price. A real gem in my opinion. That looks like an interesting guitar, but I couldn't find anyone selling it at that price - here's the Amazon UK price. Submitted by Gil Gaudia (not verified) on Oct. 18, 2017. This is an exceptionally well-written and informative article about nylon string guitars and I enjoyed learning about the nuances and main differences among the several varieties. As a writer myself, I feel compelled to point to one tiny, nit-picking correction you could make in order to make it a near-perfect piece. Near the beginning, under Methodology, you say, "With this criteria in hand . . . " It should be "these criteria." Although in your case, because of the high quality of your writing, I would assume it to be a typo, many people are not aware that "criteria" is the plural form of the singular, "criterion." Submitted by Jason Horton on Oct. 18, 2017. Thank you for pointing out the error - I've corrected it now. If you look at our other guides you'll see we do usually refer to 'criterion' in the singular and 'criteria' in the plural. BTW - We really do appreciate it when our readers help us to improve these guides! Submitted by Jason Horton on Dec. 8, 2017. Submitted by Jim (not verified) on Oct. 1, 2018. Submitted by Jason Horton on Oct. 1, 2018. Thanks for mentioning it - the Taylor Academy 12e-N is on our short-list and will be considered for recommendation when we next update this guide. Submitted by Bruce Campbell (not verified) on Feb. 18, 2019. I’m on my second Córdoba c5 and the first one the bridge came off and now this second one is beginning to do the same. You mentioned that was the only negative but unverifiable however I can’t imagine this not happening frequently. Not a well built guitar. Submitted by Doug in VA, USA (not verified) on Feb. 26, 2019. The Cordoba Fusion 12 with spruce top and rosewood back/sides at $500 barely used was a DEAL from a pal in another state. I am delighted with it for a modest price and it helps a primary steel / electric player stay with some intermediate classical pieces (Sor etudes, Guardame las Vacas, Alman by R. Johnson, etc.). And I owned 1 and played several built by pro luthier Thos. Rodriguez. For normal play a good mid-range Cordoba is hard to beat and easy to re-sell.